In the summer of 1988, some looked at Pedro Guerrero and saw a first baseman who was a defensive liability, a star diminished by injuries and a perceived lack of desire. Whitey Herzog looked at Guerrero and saw Lana Turner. On Aug. 16, 1988, the Cardinals, desperate to bolster a pop-gun attack, traded pitcher John Tudor to the Dodgers for Guerrero. Because Guerrero had tendinitis in both knees and had spent most of June and July on the disabled list while recovering from a pinched nerve in his neck, some questioned whether the Cardinals had acquired damaged goods. At the time of the trade, critics, such as columnist Scott Ostler of the Los Angeles Times, saw Guerrero as a one-dimensional player. St. Louis had tried to replace Clark _ who, as a free agent, departed the Cardinals for the Yankees after the 1987 season _ with Bob Horner, but that didn’t work. With the Cardinals out of contention by August 1988, management devised a plan for how to boost the team’s offense. They decided to pursue during the impending off-season a pair of players who appeared headed toward free agency: Guerrero and Tim Raines of the Expos. Guerrero was eligible to become a free agent after the 1988 season and the Dodgers expressed little interest in keeping him. Meanwhile, it widely was anticipated an arbitrator would declare Raines a free agent after ruling that team owners had colluded to limit offers to him when he first became eligible for free agency in November 1986. Two factors caused the Cardinals to change those plans. First, word leaked that Raines was preparing to accept a three-year contract extension from the Expos. Also, there was speculation the Dodgers might trade Guerrero to the Phillies if they could get left-handed pitcher Don Carman in return. Concerned they might miss out on both Guerrero and Raines, the Cardinals pursued trade talks with the Dodgers. Seeking a left-handed starter to replace the injured Fernando Valenzuela, the Dodgers wanted Tudor, who was the National League leader in ERA at 2.29. Cardinals general manager Dal Maxvill asked Herzog who he would want in return. The Cardinals agreed to a deal under one condition: Guerrero would have to accept a contract extension and relinquish his right to become a free agent that winter. Guerrero agreed and got an extension for three seasons at $6.2 million, including a $400,000 bonus, the Los Angeles Times reported. “Basically, it’s a premier pitcher for a premier hitter,” Herzog said to the Associated Press. Guerrero, 32, had batted .298, with a .374 on-base percentage, in 59 games for the 1988 Dodgers. Tudor was 4-3 with a 2.41 ERA in nine starts for the 1988 Dodgers, who won the World Series championship that year. Injured most of 1989, Tudor became a free agent after that season and returned to the Cardinals in 1990. 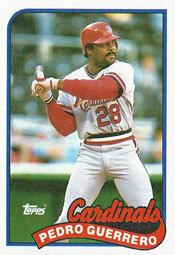 Guerrero hit .268 with five home runs and 30 RBI in 44 games for the 1988 Cardinals. He was outstanding in 1989, hitting .311 with 42 doubles and a career-best 117 RBI for St. Louis. His on-base percentage that season was .391. As a Cardinal from 1988 to 1992, Guererro produced 505 hits in 500 games, posting a .282 batting average and .348 on-base percentage, with 44 home runs.